When I looked through my hundreds of mandalas in search of the 12 … these first 13 sort of “lit up”. Their impact on my life and the lives of many others has been amazing and profound. I present them to you now right below my introduction to Mandalas Videos. Namaste. 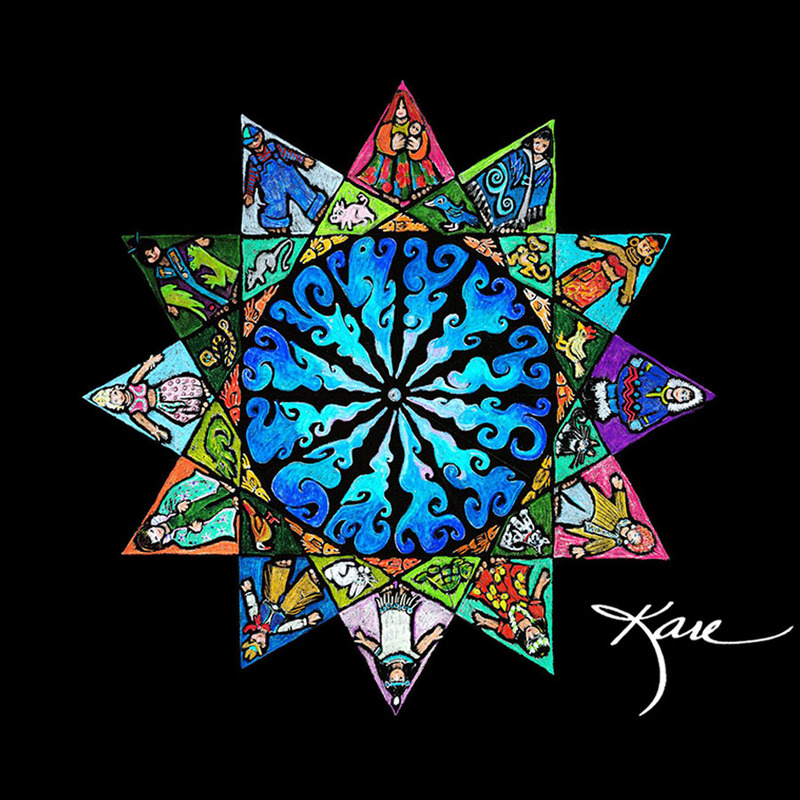 An Introduction To Kare’s Mandalas Video. Let me share with you some amazing stories of how mandalas came into being and how they can be used for meditation, healing, and self-realization. Are you ready for a simple new way to enhance your frequency and your healing? 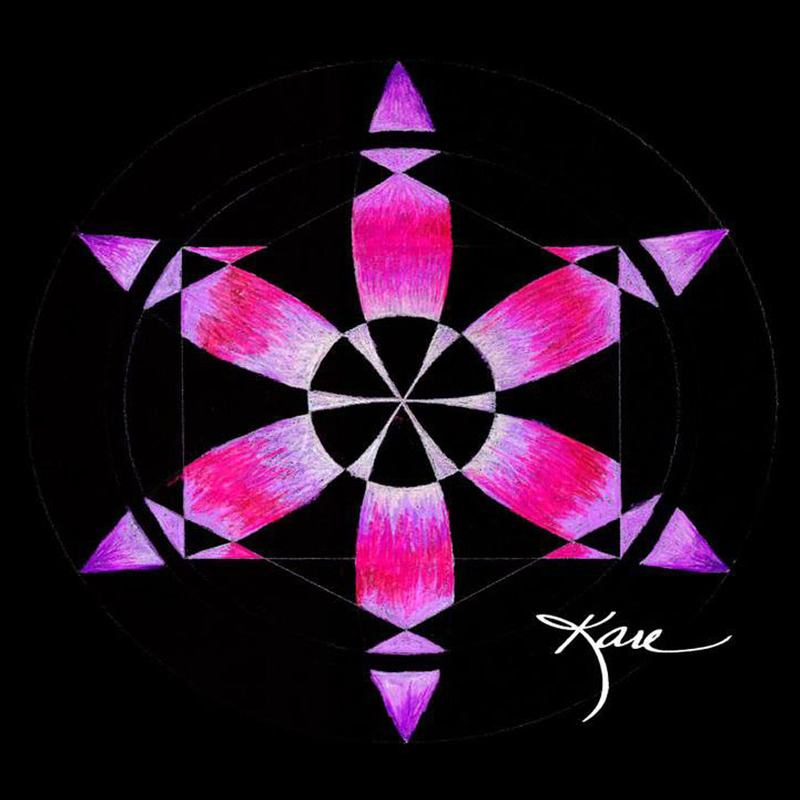 Kare’s Energy Amplifier FREE with New Year’s Purple Rice Special. 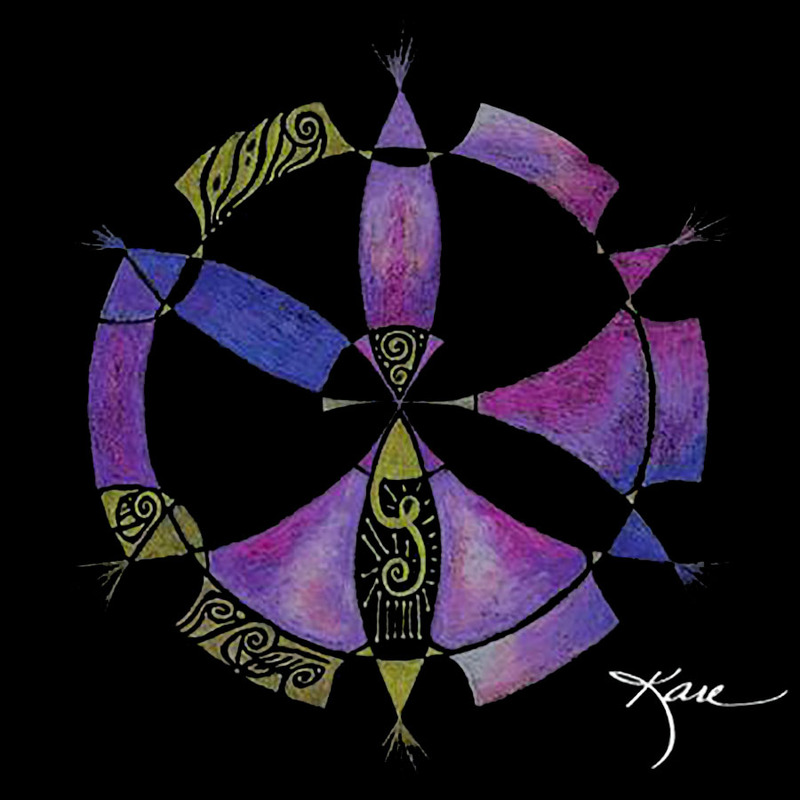 Watch as Kare shares her Purple Rice Ritual with Abundant Life Force Mandala. 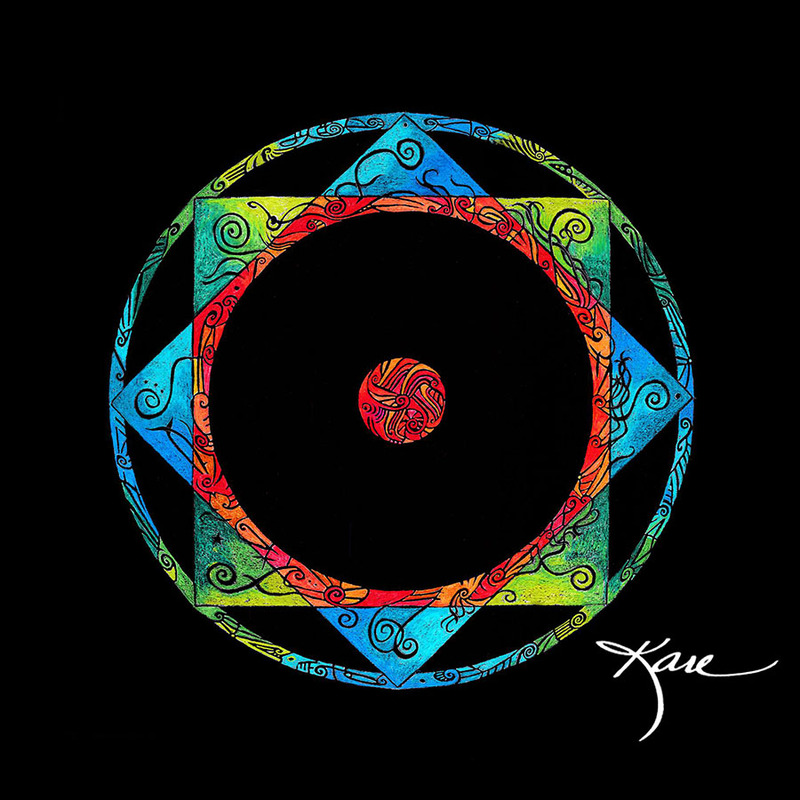 This Mandala resonates with the frequencies of the root chakra, the color red, the note C, hydrogen, and the qualities of regeneration, vitality, warmth, strength, passion, courage, and devotion. 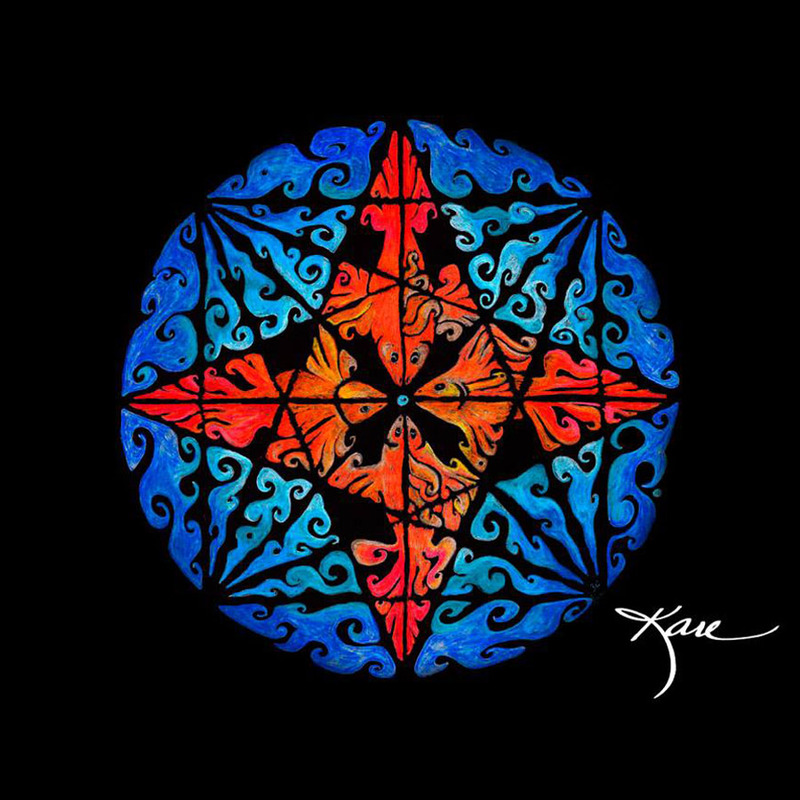 Titled “The Pearl”– this Mandala brings with it the primal life force rooted through the red-orange fish of the four directions symbolizing balance and abundance. These fish swim in the purest source water of divine flow toward the center, the secret, the pearl — which holds in it the key to the first portal … which is: “as above, so below”. Allow the Sacred Seal frequencies to resonate with you now. Feel the warmth, vitality, and strength of abundant life force ignite the divine flame of passion, courage and devotion in every level of your being. So Be It! 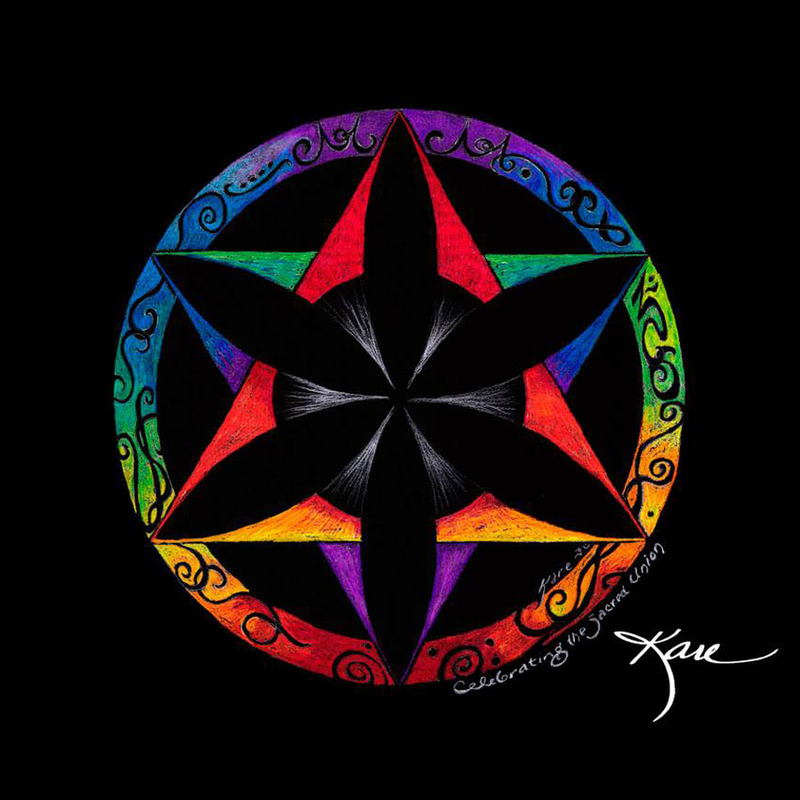 This Mandala resonates with the second chakra, the color orange, the note D, and the qualities of creativity, self esteem, fluidity, balanced emotion, balanced sexuality, joy, and well being. This Mandala carries the resonant energy of pure creativity with all its creative choice on the 8 fold path to enlightenment. 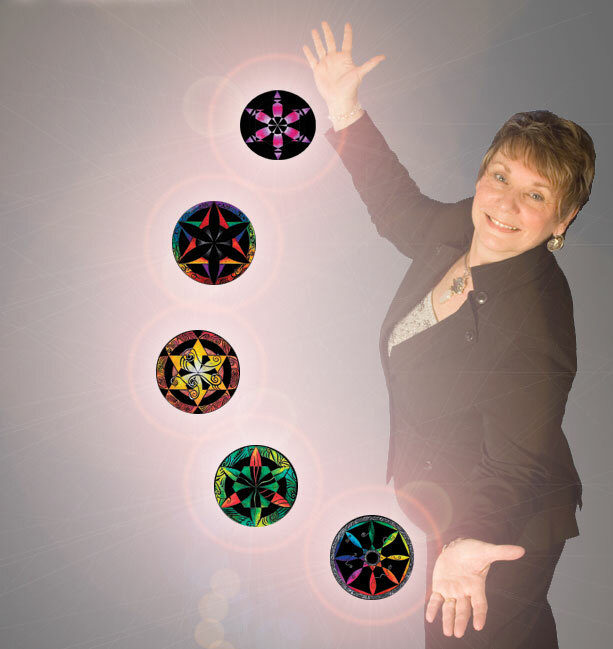 Feel this medicine wheel amplifying the power of your creativity in all aspects of your life. Allow this Mandala to unblock the creative flow… wherever blockages are encountered in your body or in your world. Stress, tension, pain, and numbness are all signs that creative energy has been blocked, trapped, or stagnated. May any blocked energy be transformed now into balanced creative energy that fuels your self-confidence to move you forward on your sacred path. 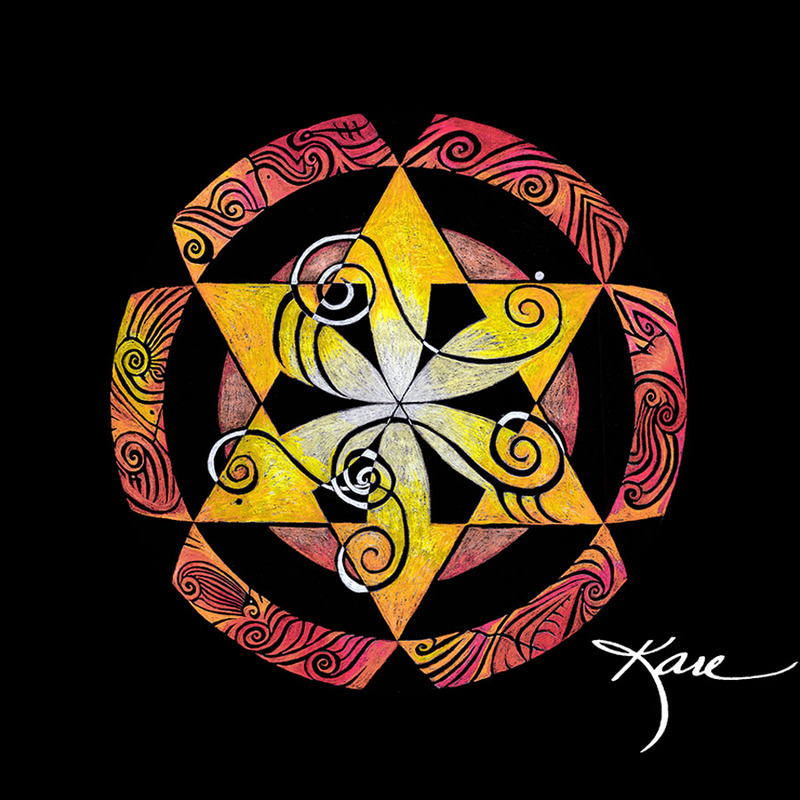 This Powerful Mandala resonates with the solar plexus, the third chakra, the color yellow, the note E, and the qualities of focused willpower and purpose, personal empowerment, intellectual awareness, knowing, and self-confidence. This Golden Flower of healing light is a powerhouse which helps manifest your personal power through focused intention. Allow the frequencies of this Mandala to resonate with you now – – enlightening the third chakra – – the solar plexus power center. Feel the sacred geometries of this Golden Healing Orb of Light as it spreads from the center of your being outward through the physical, mental, emotional, and spiritual layers of your being … enlightening your awareness, your true knowing, your self-confidence, and your personal power. You are perfect and powerful. You are the One. Namaste. This Mandala resonates with the heart chakra, the color green, the note F, nitrogen in the qualities of compassion, self acceptance, love, nurturing, relationships, purity, unity, and harmony. This Mandala carries the frequencies of inner peace. The heart chakra is the energy center which unites the three lower or earthly centers with the three higher or heavenly centers … and creates the celebration of sacred union, the sacred place of love and nurturing, and the beginning of a new generation of balance and healing. The bridge of overlapping female/male triangles have come into their new positions in this powerful Mandala. 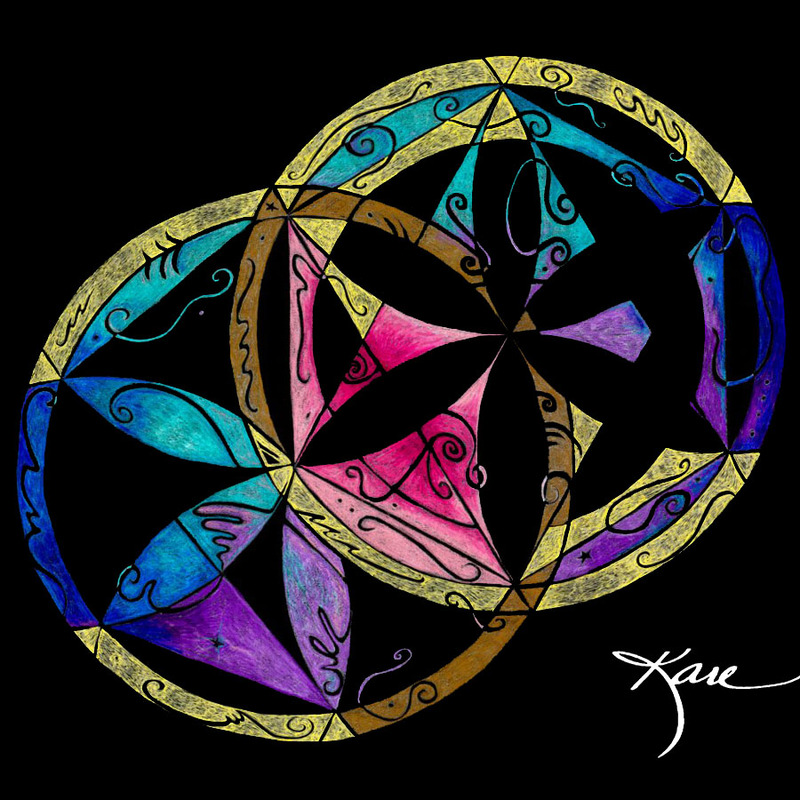 The ignited female triangle is now on top and points upward to a double bioenergetic symbol of angelic protection while the male triangle has taken on the jewel tones and has settled into perfectly balanced support for its counterpart. This loving balance of energies sparks the flower of life to bloom from this truly sacred union. Allow these newly evolved frequencies to bring compassion, self acceptance, unity, and peace to you and all you touch. So be it. 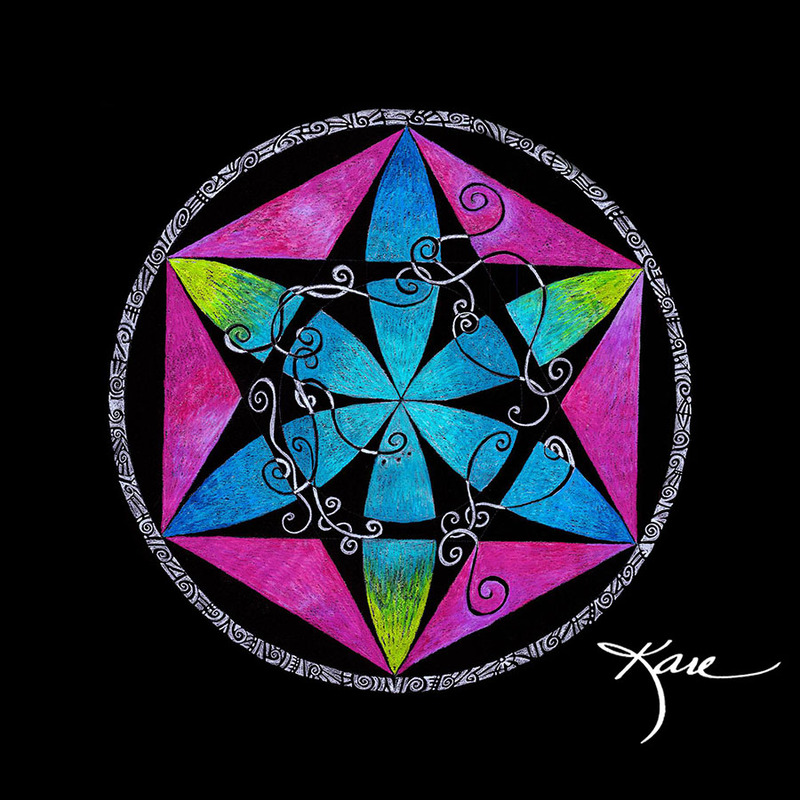 This Mandala resonates with the throat chakra, the color blue, the note G, oxygen, and the qualities of calming, cooling, peace, detoxification, truth, emotional release, and effective communication. 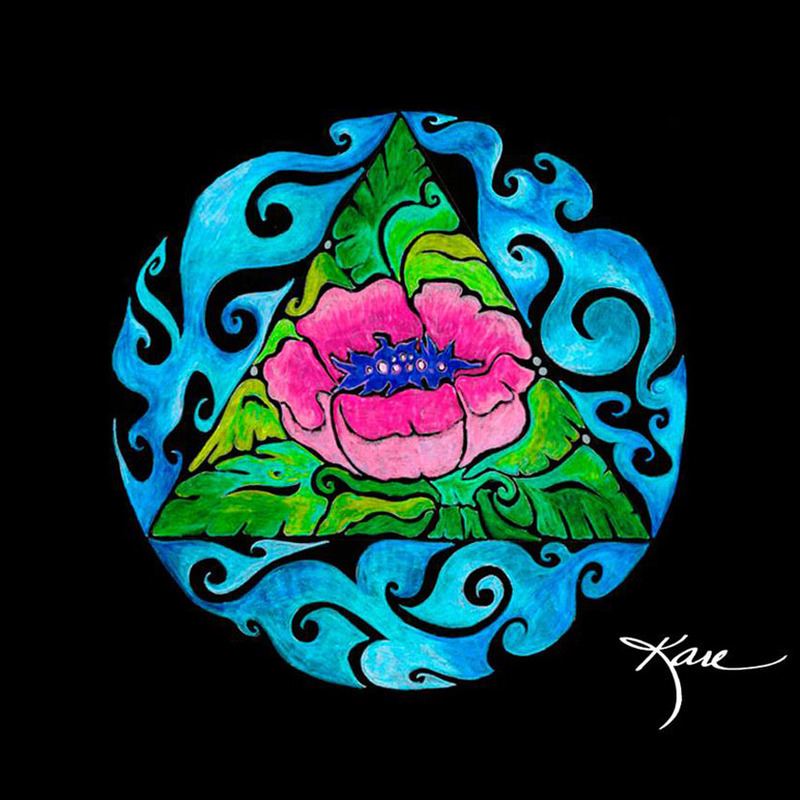 Floating in the calm blue waters of this mandala grows a perfect lotus of peace. The throat center governs our audible expression – – expression that can cause great pain or great healing to others. Feel the holy waters of communication become calm, clear, and empowered as you resonate with the frequencies of this great peaceful Mandala. Allow this lotus flower to reach its long roots deep into your darkness to support a slender stock which opens to reveal the flower of your powerful peaceful words, the fragrance of your truth, and the joy of your melodic notes. As you resonate with this sacred geometry may you truly be a channel for truth and peace. So be it! This Mandela resonates with the third eye chakra, the color indigo, the note A, and the qualities of intuition, insight, imagination, discernment, perception, realization, and mental clarity. May this Mandala resonate in your amethyst crystal cave of insight and intuition. May your third eye corridor that leads to heightened awareness be activated with ancient remembering. This sacred seal is the key to opening the portal to dimentions not bound by time or physical space. Feel your DNA relax, unwind, and release the bindings that were placed so long ago to keep us in the dark. Allow resonance with the sacred geometry of this Mandala to break the seal that has been holding you back. 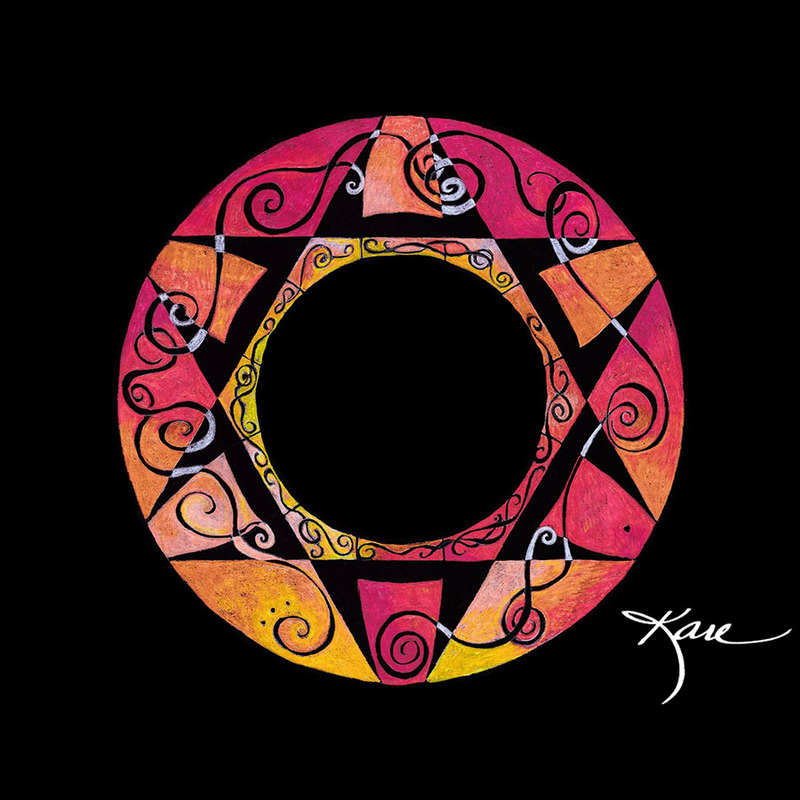 Call on this Mandala to awaken memory and to elevate you to the next spiritual level. 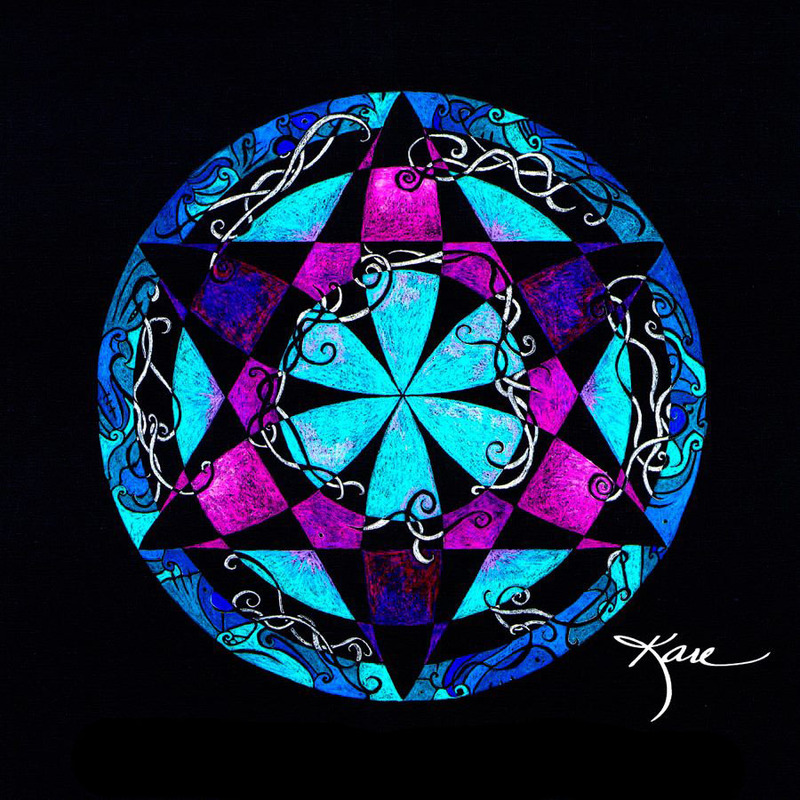 This sacred seal resonates with the crown chakra, the color violet, the note B, and qualities of divine bliss, serenity, and spiritual consciousness. When all the chakras are open and spinning … the energy can travel freely from the earth mother up through all the centers of the body. When this portal at the crown opens … pure white light from higher realms streams in through the crown center and anoints the body with Divine Light. Resonate with the frequencies of this seventh sacred seal and experience bliss of fulfillment, the ecstasy of completion, and the flowering of the soul. Breathe and allow. Let go and let God enter Now. Like a lens in a camera, this Mandala titled Blessings in Light allows you to focus the light of pure intention and amplify it 16 times. Carrying the red, orange, and yellow of the three base chakras, this sacred seal provides the three-part foundational energies for grounding, creation, and action. The swirling biogeometric designs both mirror and amplify the flow of creative life force. Allow yourself to focus your attention and your pure intention through the center of this Mandala. Resonate with your desired outcome – – see, feel, hear, taste, smell, experience fully the great up welling of gratitude as you merge the future with this now … complete and whole and joyous! So be it. May all things grow and bloom. May Mother Earth wear flowers in her hair. May the ebbs and flows be gentle and loving. May growth be peaceful and enlightening. May we live in this garden and call it Paradise. This lush green and growing Flower of Life Mandala is a gift to bring you grounding. It carries First Forest Frequencies and through them … plant spirits and devas and fairy are welcomed. Breathe deeply with your feet planted firmly on Mother Earth allow the ancient energies of this sacred geometry to nurture and nourish you in ways you’ve never known on this plane before. Relax and Remember that your purpose in this garden is to fully experience Outrageous Joy. So be it! Originally called the Traveler Mandala … This geometric structure is a vehicle for travel when used as a Merkaba. It contains much information that speaks directly to your soul. Imagine that you are the One, commander of this light ship sitting balanced in the center of this sacred geometric design. The aqua blue pyramid spins above you. The green gold pyramid spins beneath you in opposite directions with you in the center of this whirling Merkaba Mandala. As commander – – you may travel anywhere, truly anywhere with the command – – I Am That I Am! The strongest structure on the physical plane is the structure found at the center of our cells. Within it is carried the courage to gratefully receive the sacred gift – – Life. The geometric structure of this Fire Mandala fortifies the space around it. Breathe and feel its presence. So strong yet flexible. Free to move and spin but firmly connected at true center to Life Force itself. This Sacred Mandala contains both the language and organization to aid in the opening and clearing of the sacred portal between dimensions. 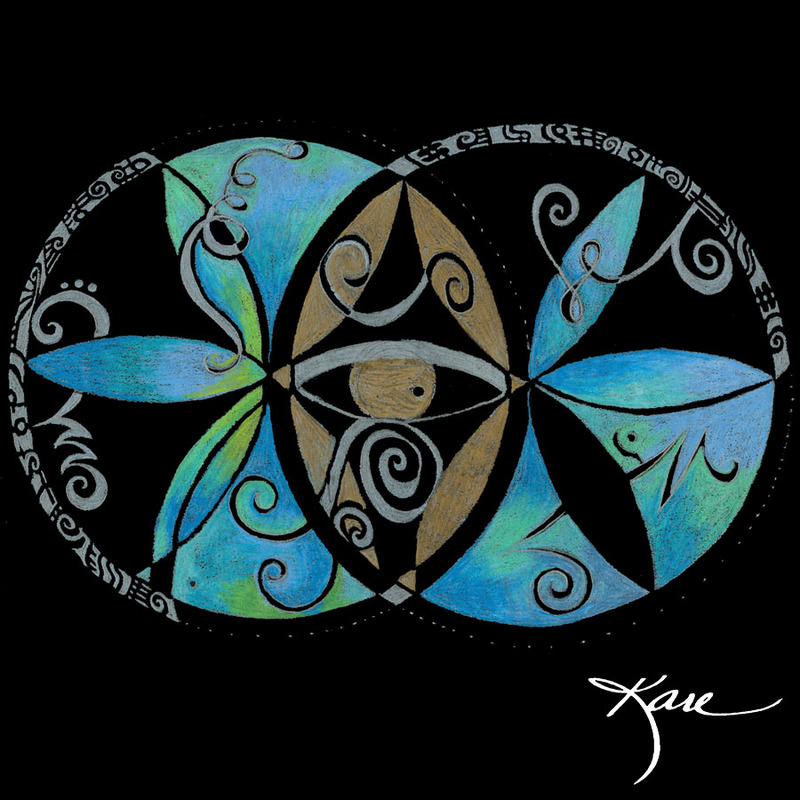 Encircled by a powerful blessing to bring in assistance to clear the pathways between dimensions, this Sacred Seal aligns us to receive crystal clear communication and channeled information. For most of us, this portal has been tightly sealed. Resonating with the frequencies of the sacred geometry can bring in knowledge and understanding that surpasses all our previous levels. 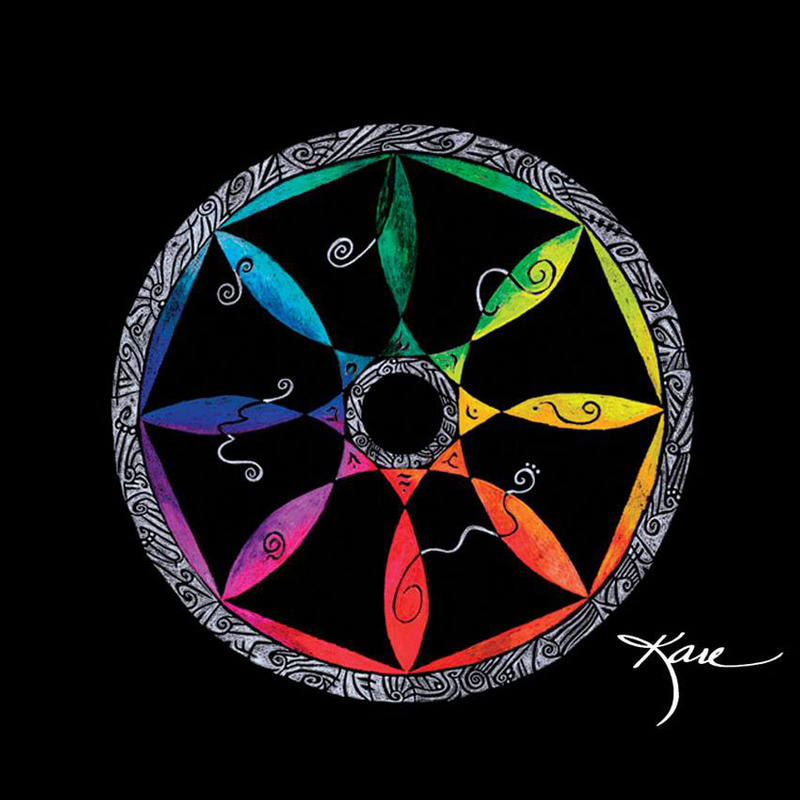 Activate this Mandala when working with dimensions of time and space – – clearing old physical and emotional pain, energy patterns, and karma. Then experience new structured information flood your cells with the light of knowing the Oneness of all there is. 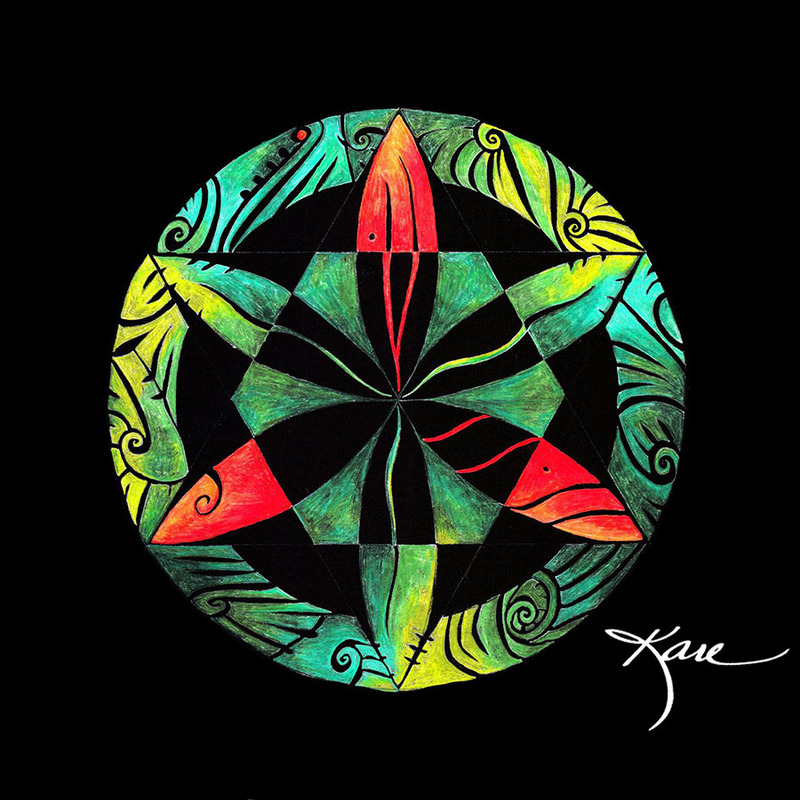 Like the children of the world, holding hands in sacred ceremony around the creatures of the air, earth, and seas … this Mandala offers a visual blessing for balance and world peace. Our thoughts are creative. What we think about we attract to us. World peace begins in our thoughts, expands to our homes, our families and friends and then throughout the world. Relax. Breathe. Smile. Allow the sacred seed of peace to grow in your heart and bloom in your body and mind. Imagine all the world’s people holding sacred ceremony to bless the creatures of the air, earth, and sea. Imagine Mother Earth pristine – – her air pure, her waters clean. Her people and animals healthy and happy. Now. This is the first Vesica Pisces Mandala that I created. It actually appears to be moving between dimensions re-creating or regenerating itself in a new dimension. Its color frequencies, sacred geometries, and biosignatures make it one of the favorites among healers of body, mind, and spirit. In Aramaic, Malkutah is translated as “kingdom” — the ruling principles, ideals, and visions of One Being. This Sacred Vessica Mandala allows the ancient all-seeing wisdom of the Eygyptian Goddess to open your eyes to vision beyond the physical. Breathe, close your eyes and look up toward your third eye center. The optic nerves cross over the pineal gland to stimulate the opening of this portal of protection, healing, and true wisdom. Blessings. 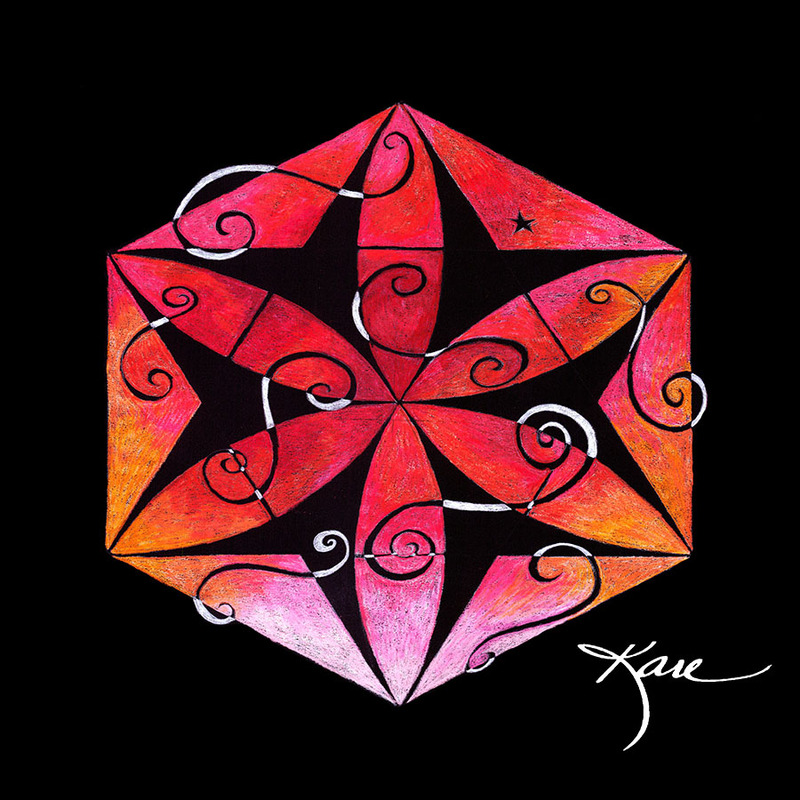 I created this Mandala during a workshop I was teaching on creating your own Personal Mandalas. It was a very unusual design for me–and It came in with the title Angel’s Portal with St. Michael’s Sword–also an unusual name. Here’s the amazing story behind the name: The day that I created the Mandala in Florida — a minister friend of mine was visiting the Sacred Site Machu Piccu in Peru. She had been guided to take one of my Mandala Necklaces to leave somewhere during her journey. A shaman guided her to a cave early that morning to watch the sun rise over Machu Picccu and she was led to leave my Mandala under the shaman’s meditation stone. When she left the cave the shaman told her the cave was named Angel’s Portal! It wasn’t until days later upon her return that we learned of the connection between the two. My Mandalas contain frequencies to open portals on the body and on the planet–this was the first one to open a planetary portal–The Angel’s Portal — Protected by ArchAngel Michael’s Sword. 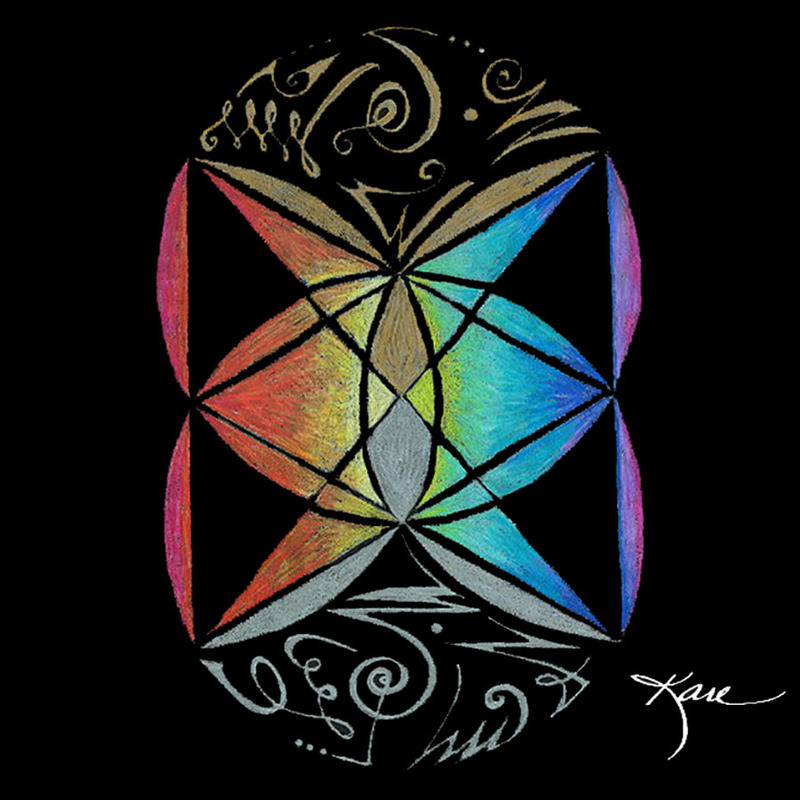 This Mandala holds strong protection over the planet and our inter dimensional connection to healing.